I don't often put Seventh Day Adventist churches on the Norfolk and Suffolk Churches sites. In fact, I think this is the first of them on the Norfolk site - being a predominantly black Church, perhaps there are not as many Seventh Day Adventist churches in Norfolk as there are in Suffolk. This is a denomination which, outside of metropolitan areas, has often reused the former churches of other denominations - in Ipswich, a fine old Methodist chapel, and in Bury St Edmunds the curiosity of a tin tabernacle which was originally built as the railway mission. It is pleasing, therefore, to find this purpose-built building on the Dereham Road, set back beside the Catholic school, but with a car sales forecourt for immediate company. 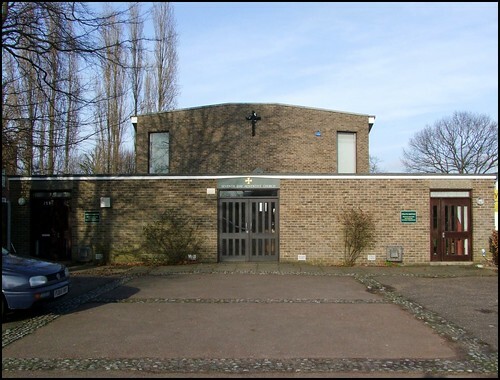 Built in the light brown brick which was popular in urban areas in the 1970s, it consists of a large hall with a single-storey entrance facing the car park and the road - it isn't clear if this is a later extension. Seventh Day Adventists famously worship on a Saturday, and have become the majority church on several Pacific Islands. Many of the adherents in this country came to England from the Carribean, often to work in hospitals, and I have to say that they are some of the nicest people I ever meet. Perhaps it goes with the territory, as they say. Norwich is a city which is historically famous for the diversity and multiplicity of its shades of Christianity, and so it is good to see the tradition continuing.